Smoking meat and fish is an excellent way to preserve it for non-refrigerated storage. A smoke house is easy to build and is not expensive if you are willing to do a little work. There are two main types of smoking, cold and hot. Cold smoking is where the temperature is seldom allowed to go over 90° F. This is the method that you use to smoke hams and bacon and allows meat products to be kept for extended periods. Hot smoking is using a very hot smoke to slow cook the fish or meat. Anything that is hot smoked has to be treated like any cooked food and stored by refrigeration, canning or freezing. Smoking fish for long term storage requires a combination of salting and smoking. Meats that are cold smoked should be cured first. Prior to starting to do any smoking for storage get some good well tried recipes and follow them closely. 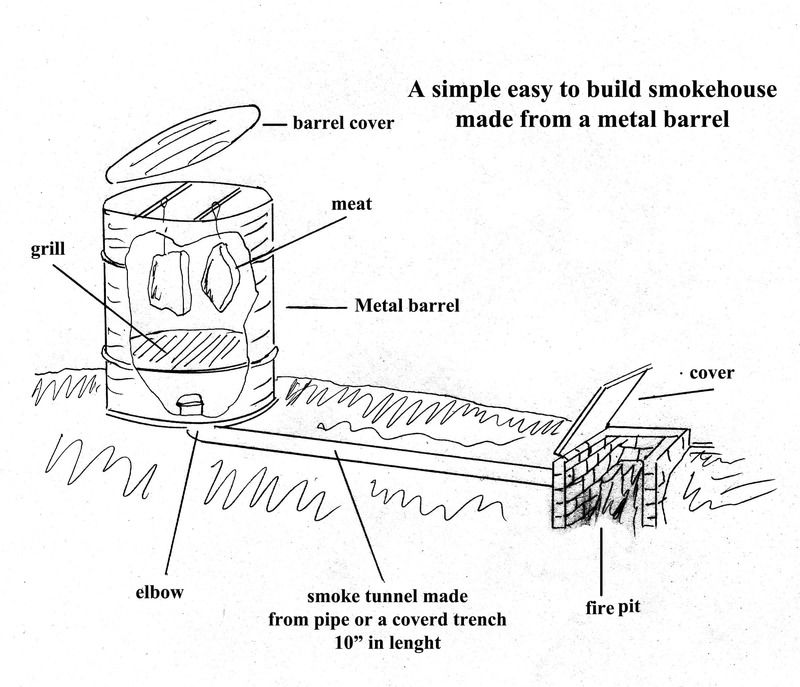 A simple smoker can be built as follows. You can use any size barrel, I think a 55 gallon metal one is about right. Don’t make the lid on top too tight fitting or the smoke won’t flow into the barrel correctly, allow some air flow. Allow the full ten feet of tunnel so that the smoker doesn’t get too hot. We will post some recipes for smoke meats and fish in the near future. Freezer Burned Meat: What Do You Do With It? This entry was posted in cooking, preserving foods and tagged barrel smoker, Howard, smokehouse, smoker. Bookmark the permalink. Is there an ideal width size for the pipe leading from fire to barrel? At least a 4 inch pipe and a 6 would probably be better.